April Fool’s Day is not an inspiration when the Assad regime and its allies have managed to stretch the credulity of a “peace process” that is going nowhere but the status quo. Turkey as the host of this weeks “Friends of Syria” meeting is not just a geographic bus stop on this now long and slow running journey of how to deliver peace and change to a Syria desperate for both. There is no humor in the lack of courage and vision with which diplomacy has made Syria a punch-line similar to what Bosnia was 20 years earlier for the ineptitude of the international community. Test for Turkey as Regional Power & Of Its Rhetoric? Turkey carries a big responsibility. It is not only about the long shared border and linked histories. The current Turkish Government was one of most outspoken against the Assad Regime’s brutal crackdown, (after having become one of Syria’s better friends in the region). The robust rhetoric implied at least a will to protect Syrian refugees and Turkey’s border by perhaps taking some direct measures to establish safe-zone or humanitarian corridors along the border. Instead though, the Assad Regime has delivered its crackdown to Turkey’s doorstep in adjacent Idlib Province and mined refugee routes. 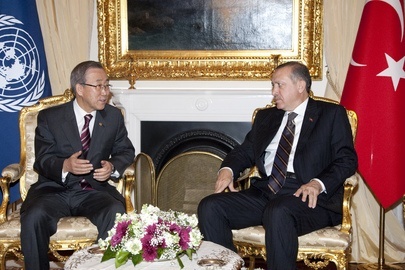 To be fair to Prime Minister Erdogan’s Government, no “Friend of Syria” has done much more. Everyone is lamenting the lack of a united international stance at the United Nations. To be certain though, neither UN Security Council action was needed for Turkey and regional organizations to take further action nor would have anyone rebuked Turkey if it undertook steps at least at its border, except perhaps Russia and China. Annan Mission Fig Leaf for Inaction? The Friends of Syria will embrace Kofi Annan’s Mission even though it is really by now effectively steered by Moscow, Beijing, Tehran and Assad himself. It is a fig-leaf but nonetheless convenient for most of the globe’s democratic western powers who do not wish to appear impotent. During the Friends of Syria meeting in Istanbul it will be Turkey that will be exposed the most – simply as host and next door neighbor to a Syrian Regime with whom it once enjoyed a dalliance. Assad’s Regime has just today announced that the rebellion is over. It will provide a momentary lull to make the fig-leaf of inaction and the Annan Mission just a bit more plausible. However, it is not over. Further, if Assad stays as Despot of Syria then it will become abundantly transparent that the Emperor-or Sultan if you prefer- has no clothes. Turkey should have learned two lessons from the rudderless policy during 3 & ½ years of war and genocide directed at Bosnia & Herzegovina – a failure also of previous Turkish Governments. The initiative is with those who take the lead and especially when there is no courage of action among the like minded (friends of Syria). If no action is taken, the status quo will persist. April 1, 2012 and the “Friends of Turkey” meeting already has the question: Who will have the courage to say and do? The Answer can be another April Fool’s Joke or a meaningful turnaround in ending murder in Syria and reasserting the leadership role that Turkey has rhetorically advanced.